Exosomes from cancer cells are rich sources of biomarkers and may contain elevated levels of lipids of diagnostic value. 27-Hydroxycholesterol (27-OHC) is associated with proliferation and metastasis in estrogen receptor positive (ER+) breast cancer. In this study, researchers from the University of Oslo investigated the levels of 27-OHC, and other sidechain-hydroxylated oxysterols in exosomes. 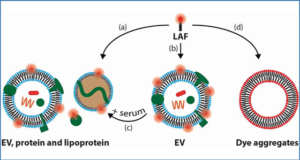 To study both cytoplasmic and exosomal oxysterol samples of limited size, they developed a capillary liquid chromatography-mass spectrometry platform that outperforms their previously published systems regarding chromatographic resolution, analysis time and sensitivity. Automatic filtration and filter back-flush solid phase extraction (AFFL-SPE) cap LC system. 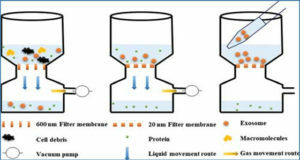 In load position sample/standard solution (100 μL) is loaded (0.1% FA in type 1 H2O, 50 μL/min) through a filter, where particles/cell debris/protein precipitates is stopped. Oxysterols are retained on a Hotsep Tracy Kromasil C8 SPE column. Excess of derivatization reagents is washed out to waste. After 5 minutes the valve is switched to inject position. 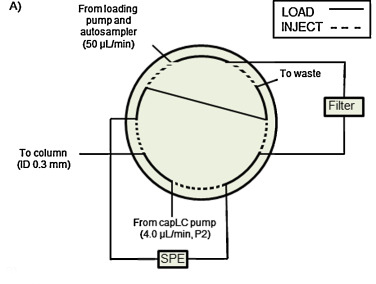 In this position the oxysterols are eluted from the SPE and onto the cap LC column while particles on the filter simultaneously are removed by back-flushing. In the analyzed samples, the quantified level of cytoplasmic 27-OHC using this platform fitted with mRNA levels of 27-OHC’s corresponding enzyme, CYP27A1. The researchers find clearly increased levels of 27-OHC in exosomes (i.e. 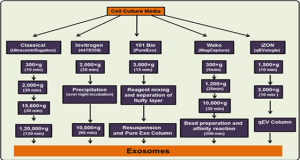 enrichment) from an ER+ breast cancer cell line (MCF-7) compared to exosomes derived from an estrogen receptor (ER-) breast cancer cell line (MDA-MB-231) and other control exosomes (non-cancerous cell line (HEK293) and human pooled serum). The exosomal oxysterol profile did not reflect cytoplasmic oxysterol profiles in the cells of origin; cytoplasmic 27-OHC was low in ER+ MCF-7 cells while high in MDA-MB-231 cells. Other control cancer cells showed varied cytoplasmic oxysterol levels. Hence, exosome profiling in cancer cells might provide complementary information with the possibility of diagnostic value.